The city of Boston has a food truck schedule on their website. It's based on permitted information and offers general neighborhood location (Financial District, Back Bay, Rowes Wharf Plaza, etc. - sometimes listing two or more) for each mealtime. Street Food Boston, created by Tatlow Park Software, is a free app that gives you up to the minute food truck and food cart schedules. It also gives you the days locations and daily schedules and allows you to track your favorites! Boston Feed Me is a real-time graphic that tracks nearly 60 food trucks around the city. It was created by a group of graduating seniors at Northeastern University Jenn Kappel, Karen Doyle, Moling Guo, and Khrystyna Reyes, graduating seniors at Northeastern University, and provides profiles of each truck with menus, schedules, photos and more. Lighted Christmas Trees - By late November and early December beautifully lit christmas trees begin to pop up all over the city. 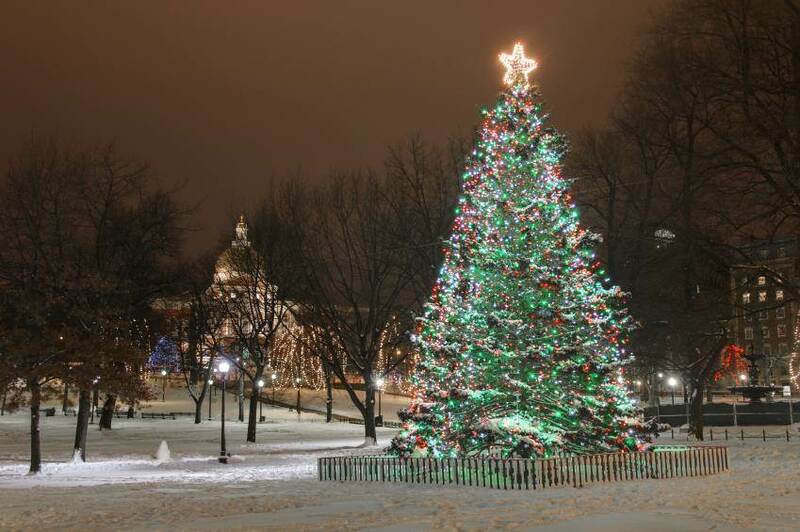 You can find two of the biggest trees in Boston Common and Faneuil Hall, which is also the site of the Blink! holiday lights and music show which is free and runs 12 times between 4:30-10pm. Here is a list of tree lightings taking place in November, and here is one for December. Ice skating on the common - If you're planning to head to Boston Common to see the glorious Christmas Tree, make sure to pack your ice skates for the outdoor rink, which opens in mid-November. Menorah lighting - Also in Boston Common you'll find public Menorah lighting each night through Hanukah (December 24th - January 1st). The Nutcracker - Performed by Boston Ballet at Symphony Hall from November 25th-December 31st. Holiday Pops - Performed by Boston Symphony Orchestra from November 30th-December 31st. Holiday shopping - You'll find unique shopping experiences in some of Boston's most charming neighborhoods. Make sure to check out Newbury Street and the Prudential Center in Back Bay, Charles Street on Beacon Hill, Salem Street in the North End, Washington Street in Downtown Crossing and Harvard Square in Cambridge. Santa - In many of Boston's popular shopping areas you'll have the chance to visit with Santa, which is a nice way to break up a day of shopping with the kids. First Night - Boston's signature New Year's Eve event includes a fireworks show over Boston Harbor, a huge Celebrate Boston Parade down Boylston Street, musical performance, ice sculptures and fun activities for the whole family. These are just a few of our favorites, but there's no shortage of festive, entertaining things to see and do in Boston during the holiday season. For more advice on activities in your neighborhood, contact one of our agents, all of whom live in the city and surrounding area.